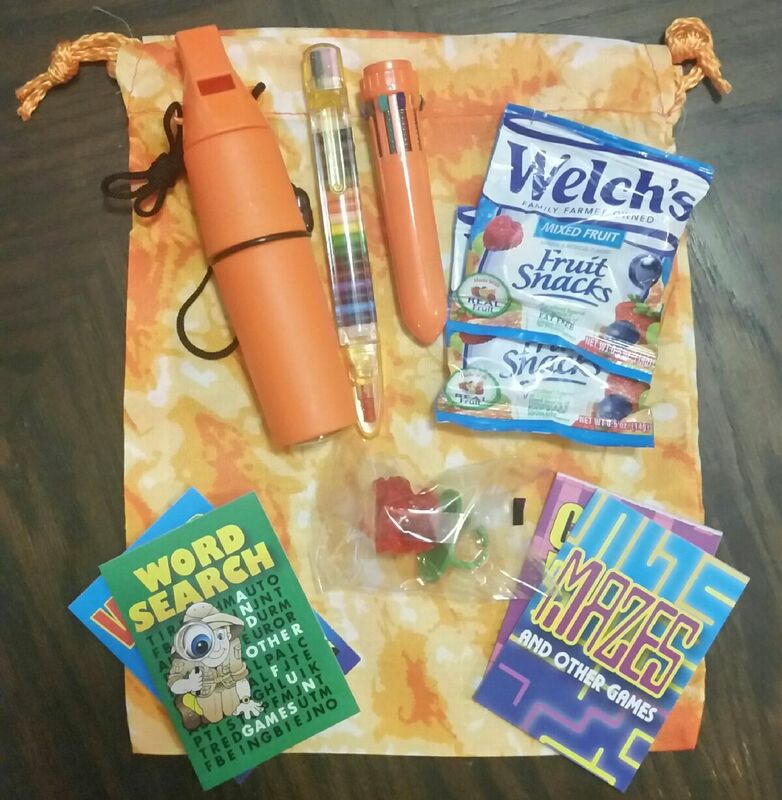 Being Frugal and Making It Work: Hands On Activity Bags for Kids: The Key to Road Trip Success! Hands On Activity Bags for Kids: The Key to Road Trip Success! When traveling with children, the key to making any road trip successful is being able to keep the kids occupied, happy and entertained! It doesn't matter what age the children are... if they aren't happy, everyone in the car is going to be unhappy! Two of my favorite ways to pass the time while traveling with kids are road games and activity bags! What you decide to include in each activity bag highly depends on the age of the children you are traveling with. Of course, each bag needs to be age appropriate: games, snacks, candy, activity books, coloring books and toys are among the most popular items! One place that I can always count on to carry the perfect items to create fun-filled road trip survival kits is Oriental Trading! My most recent delivery included so many fun items for our upcoming 5 1/2 hour Spring Break road trip with a car full of teenage girls! Of course, I wanted to find items that would be fun and entertaining for the girls. I started with some fun mini activity books. They included word searches, mazes and crossword puzzles. Not only are these perfect for passing the time, they also challenge their brains! The perfect addition to the puzzle books were some colorful glitter stacking crayons and neon shuttle pens! Each sparkling plastic crayon includes 20 different colors and a cap! Plus, the adorable shuttle pens each have 10 different ink colors. 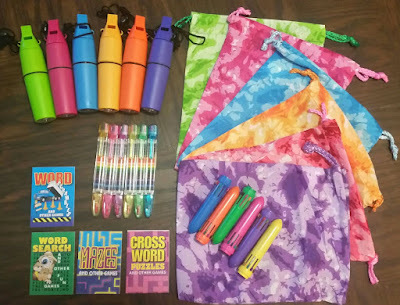 Not only will the girls be able to use these fun stacking crayons and colorful ink pens to complete their word searches and puzzle mazes, they will also be able to use them for their coloring books and travel bingo sheets! Another fun item that is both fun and functional were the whistle containers with compass. The girls will be able to wear these around their necks, hide some money inside, and be able to "whistle" for help if they feel lost or threatened. And no survival activity bag would be complete without a few snacks! Fruit snacks and rose ring pops, sweetly perfect! The colorful tie-died drawstring bags were the perfect item to "tie" all of the fun items together for the road trip! The Oriental Trading Company is a direct merchant of frugal priced party supplies, arts and crafts, toys and novelties and school supplies. 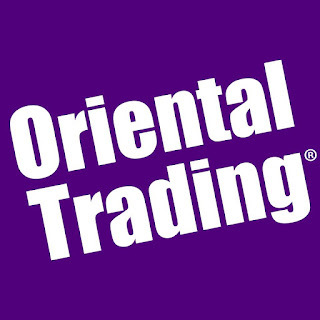 Oriental Trading makes the world more fun! Not that I could ever see this happening, but if you are not 100% completely thrilled with your order, just give them a call and they'll make it right with an easy, no-hassle exchange or full merchandise refund. It is that simple... Guaranteed! Fast, convenient, and affordable... it doesn't get much better than that! I'm also a huge fan of their clearance and less than perfect items! If you aren't already a satisfied Oriental Trading customer (or even if you are), be sure to request a free catalog today, and start making your party list! What are your must-have items when traveling with children? We love oriental trading. this looks great! When you travel, this is a wonderful thing to do with kids. They have so much fun with special things to do. How fun! It can be hard to keep kids happy while traveling, thanks for the ideas!